Hard plastic. If you decide to stay with the hard plastic cone, you can trim the cone. 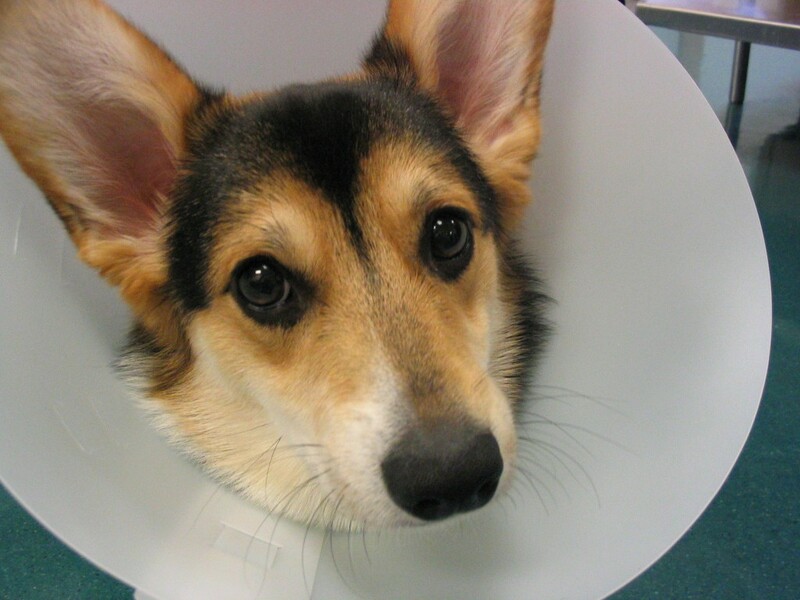 For most dogs, the cone doesn’t actually need to go much beyond your dog’s nose. This works really well for head injuries where you are just trying to keep the dog from scratching their ear, nose or face. Just take the scissors and trim around. Any other solutions you know of? ← Why do homeless people have dogs? 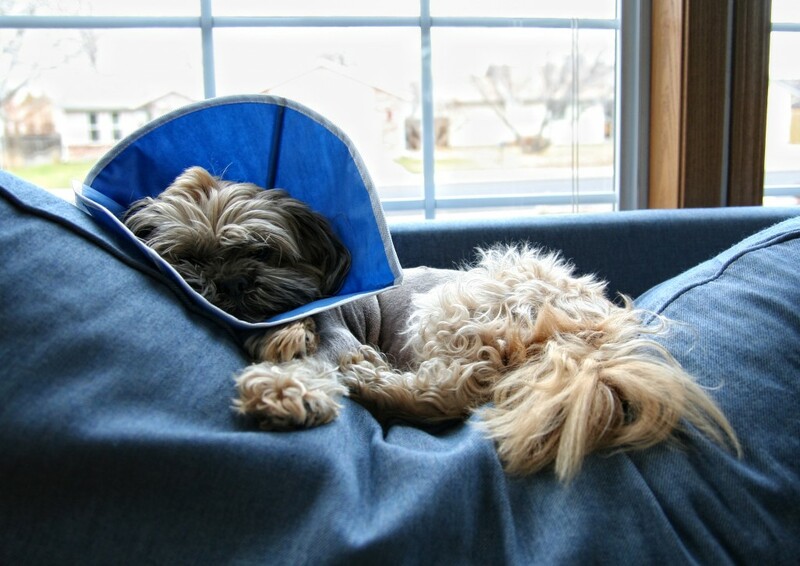 The Cuddle Cone is another good e collar alternative that we’ve used for both our shihtzu and boxer. I’d rate higher than the comfy cone, which is a more abrasive material. Also available on Amazon. The dog in the above picture has a blue soft fabric cone which I would like to obtain. Unfortunately this article does not mention what that is ! ! Jim, how about this one http://amzn.to/1JUWT2A or this one http://amzn.to/1LXpcAQ? My girlfriend is a vet and the plastic cone is the best and trimming is wrong. 1 if your pet just had surgery and needs a cone, your vet should have told you. All activities outside should be on a leash. 2 if you trim the plastic cone too much the animal may be able to lick the incision open. This is bad because they think they’re helping, but honestly they make it worse. 3 the soft blue cones don’t help they can be folded back while you are unaware and the animal can do damage to themselves. 4 and last move food and water dishes away from the wall and change them to a paper plate or smaller dish. Your dog or cat will get use to the cone and learn how to move with it. Don’t feel it’s cruel or punishment. Think of the well being of your pet. Our vet is the one that told us to trim the plastic. I agree, you have to make sure your dog can’t reach the injury. With the large plastic cone, how can a dog feed or drink if the cone is NOT trimmed. You could take it off for them to eat. The hard plastic ones from the vet are awful if you have a large dog with a short snout. My American Bulldog ripped hers within 6 hours ramming it into things, so we had to trim it anyway so she wouldn’t injure herself or us on the sharp edges. I’m just looking for a *lighter* plastic cone. I have a Shepherd-mix and he has a long muzzle and his surgery was on his foot — I NEED to have this extend beyond his nose because he is good at maneuvering. (A boxer or Rottie, it wouldn’t matter as much, you can trim if necessary.) And the cone is the only thing that works. I’d think there would be more options on the internet but no luck so far. My Golden Retriever has a facial wound that is taking forever to heal because of his immune disorders. The soft collars aren’t sufficient because he can fold them back to scratch wound. The Novaguard would be perfect except fitting straps would be right over the wound, causing more irritation. Do you know of any other low profile guards that allow for ears to be free but don’t have interior fitting straps? I found a photo of one that looks similar to the Novaguard, just no interior straps. Unfortunately, there was no product name in the photo. I’m desperate to get my boy another option. 5 weeks in the cone is driving us both crazy. Thank you! I currently purchased and am using calm paws caring collar, premium soft e-collar for dogs. It has flaps that velcrow back for feeding and eating, is a soft material but sturdy, and is machine washable. I googled and found a video on youtube to make an easy DIY ecollar with a towel. That was so comfy , sensible , easy to keep clean and worked well with our giant English Mastiff after his big operation . My dog just had major surgery and I tried the King Cloud collar just strictly for supervision…. he’s got about 40 stitches and The Cone is the very best thing after a dog has major surgery …when I put the King Cloud collar on just to supervise him.. I turned away for a second and he turned his whole head around and was right on top of stitches ready to lick it open and it was only the second day… this is with supervision …could you imagine if I left him alone with that on… I’ve looked on the internet.. I’ve looked in the stores.. really on the same level as the King cloud…. I figured I would try something again now that he’s getting a little better he has another week….. but they do not work so we’re going to have to endure the cone for another week.. I mean they are the best after surgery on every level ..unless your animal has a small surgical incision on the very top of his body near its head where he can’t get to it….